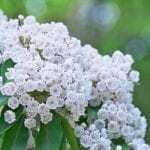 Is in possible/practical to start Mountain Laurel plants from cuttings. I have a well developed, more that 50 year old plant that needs to be trimmed almost every year. What is the best type of wood for a cutting and what preparation leads to the best results? You can propagate with cuttings and a soft cutting, on current green growth has the best chance of survival. Take slightly green and pliable cuttings in the fall, just before dormancy. 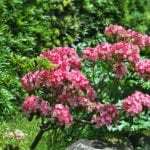 Use a rooting hormone on the cuttings, either liquid or powder formula. Fill pots with equal parts sand and perlite and have a clear cover or plastic bag to cover the pot. The medium should be kept moist and at a constant temperature of 75 degrees with a germination mat. It can take 4 to 6 months for the cuttings to root.